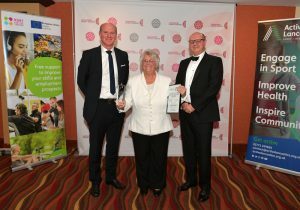 Sponsored by The Regenda Group, this award is for an individual who has shown a consistent lifetime commitment (20+ years) and made a major contribution to community sport within Lancashire. The winner of the Jimmy Armfield Lifetime Achievement Award was Marilyn Gregson. Marilyn has been involved with Preston Panthers Multi Sport Club for over 20 years. The club was the first sports club in Lancashire to offer young people the opportunity to be part of a sports club which would cater for individual needs and aspirations. Marilyn was there from the beginning as a parent who understood the need to have such a club in Preston, as in 1998 no clubs catered for children with impairments as inclusion was never considered. In 2002 Marilyn became Chairperson of the club which only had 8 members and £80 in the bank. Marilyn established a committee, this is where her challenge began. This remarkable lady has fought and dedicated her life to ensure her own daughter and all other children with a disability in the area have the same opportunities and chances as everyone else. Her dedication and passion has gone on to see the club thrive to the success that it is today.